The Lagos State Police Command said a suspected robber, Yusuf Nasiru, has started giving information to detectives because he is angry that his gang members gave up on him when he needed them most. burgled a shop on Ijebu-Ode Road, Ikorodu around 2am on November 15. According to the police, the hoodlums arrived the scene in a Mazda bus with number plate, KRD 783 XW, and started breaking the shop. 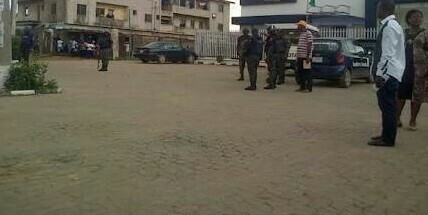 Their operation was reportedly aborted midway when policemen on pin-down duty near the scene alerted the Divisional Police Officer in charge of Shagamu Road Police Station, CSP Adekunle Omisakin, who arrived the scene with a team of anti-crime policemen and engaged the robbers in a shootout. “When the robbers could take no more of the fire exchange, they jumped into their car and drove off as quickly as they could. “The police team chased them. Along the way, the robbers pushed one of their colleagues with bullet injuries whom they thought was dead, out of their vehicle. “The team recovered the man, revived him and he gave his name as Yusuf Nasiru, aged 34 years. He was searched and a knife and some charms were recovered from him. “He was thereafter taken to an undisclosed hospital for medical care. “Meanwhile, the suspect, miffed by what his gang members did to him, is cooperating with the police by giving useful information,” the police spokesperson, CSP Chike Oti, said in a statement on the incident. He said the state Commissioner of Police, Edgal Imohimi, assured residents of the state of peaceful ember months, adding that the crime-preventing strategies of the command were working.